Pretty Things: "The Missing Link" Book Tour Stops HERE Today! 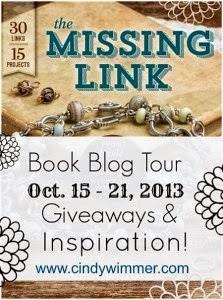 "The Missing Link" Book Tour Stops HERE Today! 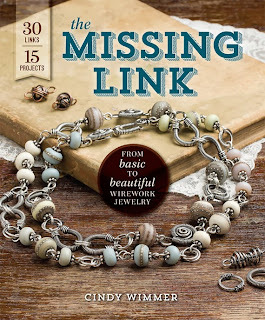 I'm so happy to have been asked to participate in helping Cindy Wimmer bring her book, "The Missing Link", to fruition. It seems like years since we tossed ideas across dinner, and now she's created the MUST HAVE book for anyone who want to learn wire techniques as well as those who are already wire fanatics. I have two pieces in the book using several links taught by Cindy. I used copper and bronze and learned a LOT. I was very nervous about being in a book that centers on wire. While I love wire, I distinctly remember the first time I met Cindy.... she was wearing a long, amazing necklace, very similar to the one on the cover of her book. I constantly want to steal everything she makes, but this particular necklace just always drew me in. With this book, I'll be able to use my favorite hoarded beads and make my own necklace. The beauty of wire is it often has a mind of its own, so even though I'll be following Cindy's instructions, chances are my piece will be quite different than hers. Both of these links are MUCH larger than your link will be if you follow Cindy's instructions. It's also an excellent example of why you should buy the book and not try to guess and try to reproduce from the photos you'll see throughout the book tour. Cindy has it down to a science, from the exact gauge that works to the exact measurement to turn your pliers. Now, this doesn't mean you can't experiment. Obviously, as shown above, I did. I'm not at all happy with my first experiments BUT, I plan to wrap them with tiny gemstones and work them into another design. Win/win. Some links lend themselves well to adjusting gauge. In this example, I made the same link but with different gauges. 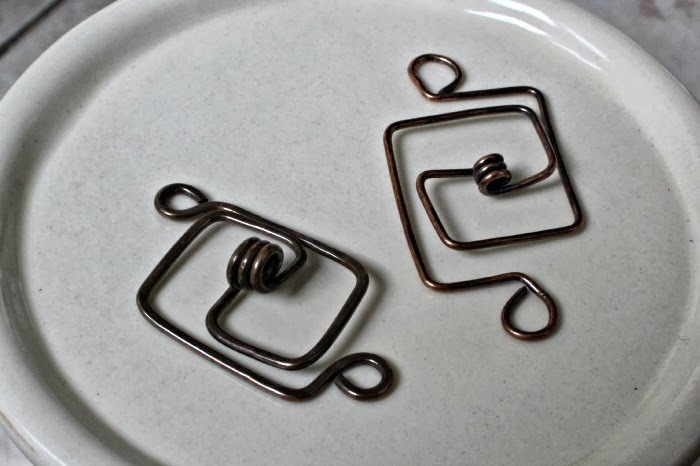 Depending upon the size of jewelry you're making, you'll find that many of Cindy's links are easily adaptable. You can also play with oxidation or leaving the metal raw. Now here comes the fun! Each of the reviewers will be giving away a copy of Cindy's book. All winners will be announced on Cindy's site on October 21st. you get that many more chances to win a book! 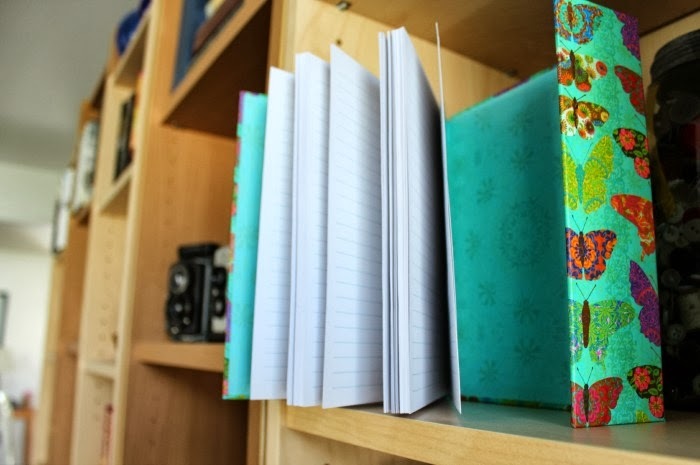 In addition, I'm giving away a journal for you to sketch out all the ideas I know will be bursting out of your head when you read Cindy's book! I'll also announce the winner around the 21st. inspirations, and don't forget to comment for the giveaway! I love this! I can't wait to try out Cindy's techniques. Wire AND Second Surf? Heaven! I love the necklace you made, Lori, and great tips on guages. This book looks amazing! Hi Lori. Hope you're feeling better after the Bead soup blog party. that was an amazing event you put on. I was so happy to be part of it. Love your links and finished pieces, even the ones you didn't follow the instructions for, lol.You gave good advice for those of us who just have to do it ourselves. BUY Cindy's BOOK. I'd rather win it though. so please pick me. LOVE what you've made here. I've pre-ordered the book on amazon, but it's not out here til December, so am enjoying seeing sneak peeks. If international entrants are allowed, please throw my name in the hat - if not, never mind, I'm enjoying everyone's blogs nonetheless! That's some really neat stuff! Cool getting a peek into a world I never knew was out there.. thanks! Oh how my drawer full of under used wire would love to have this book on top of it. Have read great things about it. I really like how you incorporated those links with Barbara's beads. It's a fine mix of color and textures. I'm patiently waiting for my copy of the book. I've always admired Cindy's wire working techniques. It always feels substantial without being heavy. Your pieces are gorgeous, Lori ~ and I can't wait to put my hands on Cindy's book, as much as I love trial and error :) Pick me, pick me! LOL - thanks for the opportunity, and for sharing those tips! I love the examples in different gauges. And I'd love to win this book too! I would so love to win this book! I've been a fan of Cindy's for some time, and I'm always blown away by her talent for design! What great links and a wonderful necklace you created with the links. I like that you showed us what can happen or what the difference may be if you experiment. I always like experimenting. :) I can't wait to get a copy of the book. I love your review but as I can not play with wire leave me out of the giveaway. I do love love love your links and I can see them mixed with my seeds to look amazing!!!! Lori, we do have some great memories from way back when - talking about our book ideas! Thanks for being there and for being such a wonderful contributor to The Missing Link- your designs are a real asset to the book! Oh how I WANT this book. Thanks for sharing, Lori. I'd love to make some things from this book. 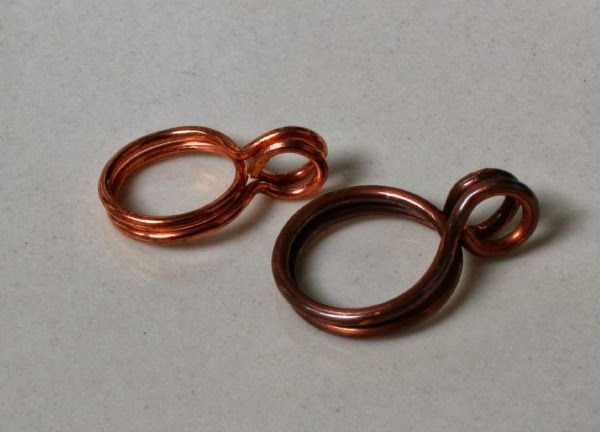 I have really enjoyed working with wire, and would love to be introduced to these techniques! Looks like an awesome book! I want to learn more about wirework. I've been waiting for this book to come out - getting a chance at a free copy?? AWESOME!! Lori - always so much to learn! Would love both of the books ! Thanks for the opportunity! Thanks, Lori, for sharing your tips and learnings with the links from Cindy's new book! She's amazing with wire! I have admired Cindy's work for so long. Can't wait to see her book and to try out some new techniques. This book is so exciting...hope I win. I am so happy to have this book, as improving my wire working skills is high on my priority list. I would love to win the book. Just read your last post - hope your craft show goes well. I love what you did with that link, very unique. I can't wait to get this book (by winning or buying, either way, it shall be mine.). Hope you are feeling better and keeping your chin up. I know it is hard, but you have the best motivation in the world; a wonderful life, a beautiful boy and a faithful and loving husband. I just got a copy and was so thrilled to see you were in this book, too. 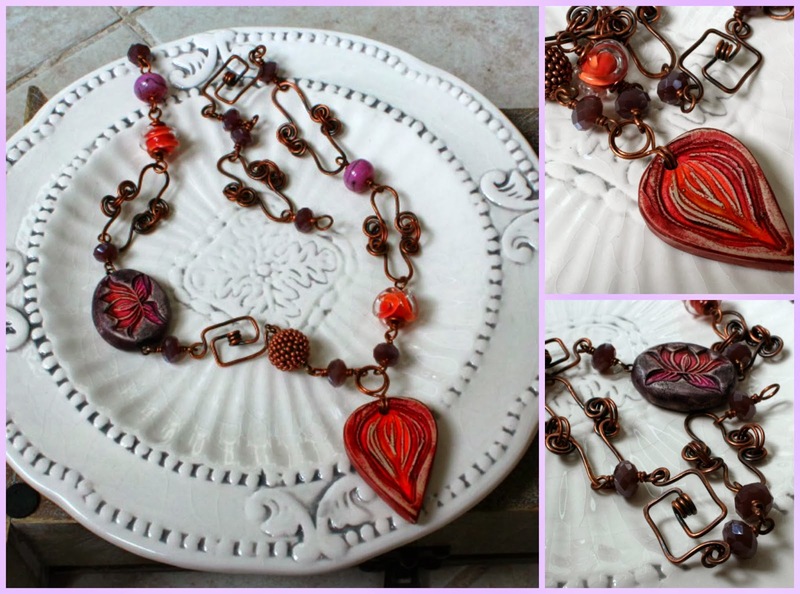 Looking forward to working more with wire as I have a stash of hoarded beads as well. Oooh! I love your necklace! I hope I win the book but if not, it will definitely be on my Christmas wish list! Keeping my fingers crossed! Thanks for being part of the hop and giving me a chance to win! Your advice on wire gauge is excellent. I eagerly look forward to reading Cindy's new book. I'm hoping I'll win a copy, but if not, Santa knows I want it! Hey Lori. I felt similar when Cindy asked me to participate in her book. Working with thicker gauge wire was not 100% in my comfort zone. You sure worked out the kinks in your links, so to speak, because your pieces in the book and this post are beautiful! I can't wait to see this book in person, I know I'll be drooling over all the wonderful things in it! I think I could really learn a lot from this book, just looking at all the great pictures has my creative juices flowing, and my fingers itching to create! I can't wait to receive my copy. I'm playing along because I have a friend her who'd love the book, and from everyone's reaction I don't think I'll be willing to share any time soon. Glad to see posts from you again. Beautiful necklace! I just received my book today. It is amazing, so detailed! Love that necklace with the links! Just got my copy of the book today. Can't wait to go through it. I have been wanting to do more wirework and improve my skills. I hope I win! wow.. your necklace is gorgeous. I really want to read Cindy's book. Fun necklace the links really are a great look with those beads! I would love to win a copy of this book! It really is meant to be since my pre-order at Amazon was mysteriously cancelled. What I've seen in these photos on your blog just make me want that book even more!!! And your necklace is really beautiful!! Well, you certainly make me wish I had that book! I hope you share the finished project after you wire-wrap the armatures that you created! LoVE, LoVe, LovE, your necklace. Can't wait to dive into Cindy's book. It may be awhile before I can even pick it up and look through it. In the meantime I hope to see some more beautiful jewelry from you. Lori, Thanks for sharing your take on this book. I've been a fan of Cindy's since I found here in Wire Style. I appreciate the opportunity to win a copy. I would love to win this book; thanks for the opportunity. Love all the pieces you made using the links from this book. I can't wait to get a copy! Lori - Congrats on contributing to the Missing Link - I got my copy of Cindy's book in the mail yesterday and your necklace and bracelet inside are just beautiful! Lori, As usual,your designs never disappoint! What a great book. I would love to win a copy. I love what you made using Cindy as inspiration! Thanks for a chance to win the inspiring book! These sneak peaks are driving me crazy! I can't wait for this book. Hi Lori, I had chance to peek into Cindy's book and its full of amazing stuff beyond simple wire-wrapping ! Loved your designs and its awesome that you featured with such talented co-designers ! This book looks like so much fun. And yes I am already thinking of variations, so that journal would be quite helpful. Thanks Lori. I hope I can win a copy of this book with Cindy's signature on it. Lori - I'm excited to hear about this book. I've been searching for a really good book on wire. I would love love to win it, but I'm going to look for the book either way. I've bought wire, and played with it a little, but I would love to learn how to really use wire. Thanks for the review on it! I love books and this one looks like a great one to get!! Absolutely love your necklace in the blog. Can't wait to see the book and what lovely pieces you contributed! Great work. You and your work are such an inspiration. Some truly beautiful wire working. And the chance to win a sketch book too. Lori, you ever so generous. Beautiful work. I'd love to learn to make these links. Thank you for the opportunity to win a copy of the book. I just would love to try and experiment myself, thanks for the chance to win a book! Thank you for the review of the book and the opportunity to win it! This book looks wonderful! Would love to win a copy. This book look wonderful! Would love to win a copy. Got a sneak peek of this book. It is amazing....Gana get this book one way or another. Great investment! winner of "The Missing Link"